Close integration with www.3wheelerworld.com and the 15+ year long spanning forum membership. This is a community store made up of many long time members of the site, and also people that come to the site looking for help and advice. This is your prime clientele and demographic to sell towards. Free Marketing. 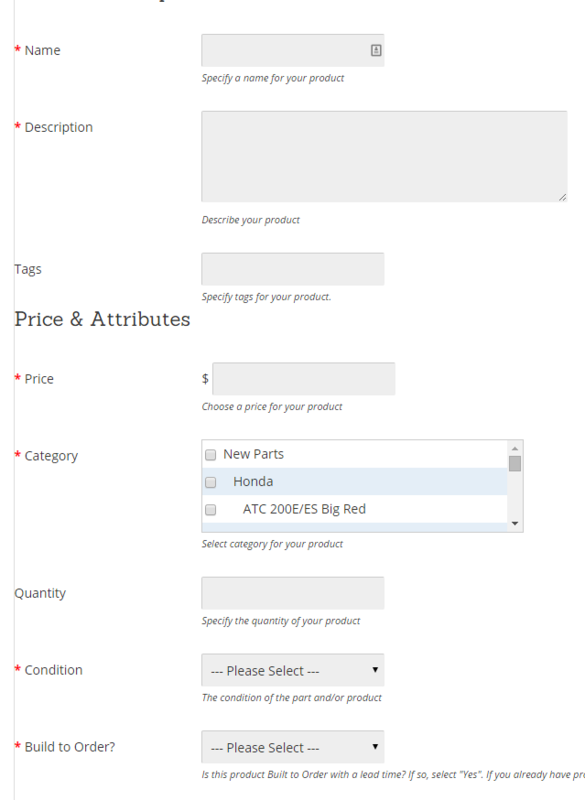 There is an already established customer database specifically interested in three-wheeler parts from Version 1.0 of the 3WW Shop. There are 30,000+ members of the message board we can reach through email newsletter marketing. We also have the ability to reach out to several different three-wheeler related social media niches. You guys list the products, we'll make sure the traffic and prospective buyers get here, on our dime. Not yours. We do that through email newsletters, social media, and in the near future, snail mail post cards to existing customers even. Because of the close relationship with the message board and forum, we have great search engine ranking and results. A many, many countless hours has been spent developing and tweaking parts of the site to help make it easier for people searching Google and other search engines to get what they are looking for. You're walking into an established traffic and customer base. Each seller builds off of each others traffic and interest. Your first customer could have very easily been searching for something else entirely, came to the store, and then found your product almost by accident. Again, because we are working on a shared traffic and customer interest basis, the more eyes each seller has on their own products. Its cheaper* and easier to list items. 6% commission due on sale. That's it. There is no corporate red tape and hurdles to jump through in listing your products or keeping your account open. The entire point of making this unique selling environment to begin with was so that people manufacturing low volume parts at home or in their garage with minimal time to manage sales operations (like in the evenings after getting home from your real job) could have an easy way to do that. Completely mobile friendly easy to use consumer side of the site. We built this site with the intention of having some guy sitting in his garage next to his bike on his smart-phone being able to search and find what he wanted and checkout without ever having to leave or get distracted. Impulse and instantaneous purchases are extremely important, if your prospective buyer gets tied down in layers and layers of product categories, a difficult check out process, or tiny text on his phone he cant read, he'll go elsewhere. We were extremely conscious of this fact when designing the 3WW Shop version 2.0 that you see now. How hard is it to list items, is it easy? What if my products do not fit any of the categories I see listed here? We've got a pretty wide array of categories and places to put items, but feel free to give us a shout and discuss what your needs are and we will talk about where it can go or possibly creating a new category. If the namesake didn't make it clear, we're looking for 3wheeler specific parts and products. For our used section, that can be stuff you've had laying around in your garage or shop collecting dust. Maybe your a dealer for quality aftermarket components that fit and have a use on a vast array of different three-wheelers, perhaps you're offering a service that other trike riders would find value in. Perhaps you're like most of us and found necessity to be the mother of all invention, and just figured you'd make everyone elses lives a little bit easier too with your solution to a discontinued component. Or maybe you've just found a way to do something better. We'd love to have you here. So here is where the rubber meets the road. There are no membership fees. No product listing fees. No residual or monthly costs for adding your products to the shop. You are only charged when your product sells. The fee is 6% of your total received payment. This model puts zero overhead on you as the low volume manufacturer or reselling vendor, and its still considerably cheaper than pretty much every other online shopping portal you'll encounter. The site is designed exclusively around the PayPal payment platform. It uses a unique and relatively new checkout process PayPal introduced call "Adaptive Payments". Adaptive payments allows one checkout from a customer to split the payment to several different receiving vendors. Until just a few years ago, this technology did not exist - all customers would have had to provide individual payment and checkout data to the seller for each specific item they were buying. That's why this "group marketplace" concept has not really been seen very much around the internet and certainly not in our little niche before! The above is an example of the system and is not a complete description of the fee system required. Graphic compliments of PayPal. In a nutshell, the customers add the products they want to their cart, they checkout. You get paid instantly - an order confirmation email is sent to you and any other sellers, as well as the customer. That's it. No net 30 terms or waiting for a payout from a middleman. It sells, you're paid instantly via PayPal, you ship. That simple. You'll first need to sign up for a regular buyer user/customer account, using this link. After that process is completed, you can log in to your "My Account" area, and then fill out one last form to apply to be a seller. All new vendor accounts are personally reviewed before being activated - please make sure to fill out all fields completely. Thanks for checking us out, and hope to speak to you soon!